On World Refugee Day, HRC honors the strength, courage and contributions made by countless refugees in the U.S. and around the world. 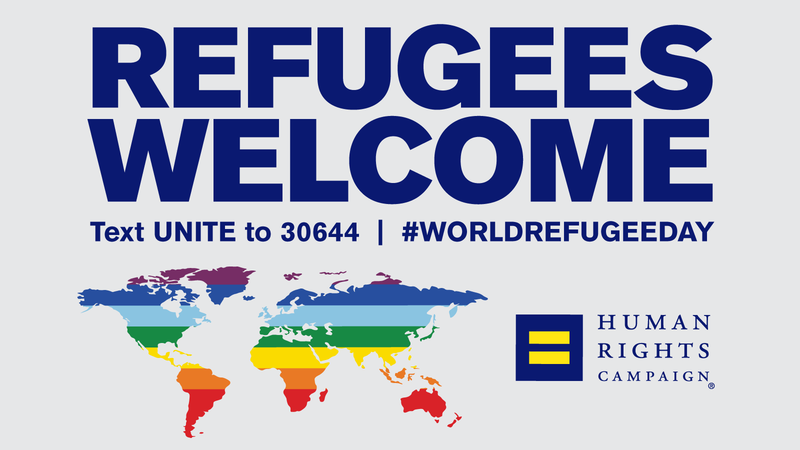 Today we recognize all refugees, including LGBTQ refugees who are seeking refuge from persecution and violence they face in their home countries. These perilous times have been compounded by the rise of the Islamic State, government regimes and other anti-LGBTQ organizations looking to hamper or end any human rights progress. Concerns continue to mount for those looking for safety in the U.S. only to have their dreams deferred by President Trump and his administration’s discriminatory policies. Since the day he was sworn into office, Trump has been adamant in issuing directives that would close our borders and turn away those at most risk of facing real harm in their home countries. However, his travel ban, which blocked refugees and travel from several predominantly Muslim countries, has stalled in the courts. Just recently the Ninth Circuit Court of Appeals ruled unanimously to keep Trump’s refugee and Muslim ban on hold -- another resounding defeat by the federal courts in recent weeks. While the latest developments signal a positive trend that the U.S. will not tolerate discrimination based on religious identity, there are still far too many many countries that will condemn, persecute, and even execute LGBTQ people just because of who they are. In Chechnya, dozens of gay and bisexual men have been detained, beaten and tortured, yet local authorities have refused to acknowledge the matter. Last week, U.S. Secretary of State Rex Tillerson said he hadn’t raised the issue of the Chechen atrocities with the Russians at all. HRC has called on the U.S. government to condemn these crimes and grant victims refuge in the U.S. Unfortunately, only a handful of countries have provided a safe haven for them. Chechnya isn’t an isolated event, since across the globe -- from the Middle East, to Libya and Sub-Saharan African -- anti-LGBTQ violence is commonplace. This year, two Iraqi soldiers spoke before HRC’s fourth Annual Time To THRIVE Conference describing their heroic story of falling in love in the Middle East, only to then spend years fleeing and fighting to find a place to call home together. We face the largest refugee crisis in history, with roughly 65 million people displaced globally -- including tens of thousands of LGBTQ refugees and asylum seekers -- we must demand our elected officials do more to face this growing crisis. Today, and everyday, HRC and dozens of human rights organizations will speak up and stand up against discriminatory policies wherever they appear -- at home and abroad.